The Fiery Globe is an Emblem Heartless that is found in Kingdom Hearts II. It resembles a miniature fireball. It is controlled by the Volcanic Lord. Whenever Firagun is used on the Volcanic Lord, the Volcanic Lord explodes into a group of Fiery Globes. Its counterpart is the Icy Cube. 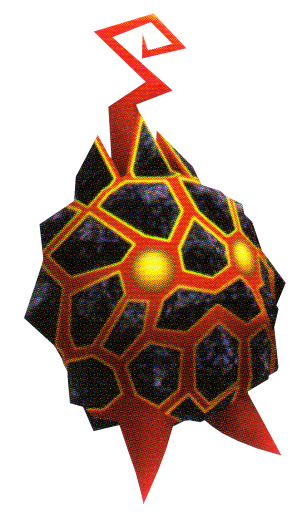 The Fiery Globe is a very small Heartless that is shaped like a molten, rocky sphere. Two glowing, yellow eyes are visible poking through the fragments of rock. Its legs are featureless red spikes that protrude from the bottom of the globe, and a twisted, red antenna sprouts out of the top. Its Heartless emblem is on its back. The Fiery Globe's name refers to its attribute and general shape. It is also a contrast to the Icy Cube's name. Fire Attack (ファイアアタック, Faia Atakku? ): Rams target, flinging small flames. Fiery Globes have little HP and are especially susceptible to Blizzard magic. Since they often show up combined with the Blizzard-proof Fortuneteller Heartless, using Magic can prove tricky. Just use the Keyblade, or the Magnet or Thunder spells, to make short work of them. They tend to appear en masse. This page was last edited on 2 May 2018, at 17:40.